It has been launched with a crowdfund campaign on kickstart for a price starting at 15 $ ! With shipping fees, the total price is about 31 €. 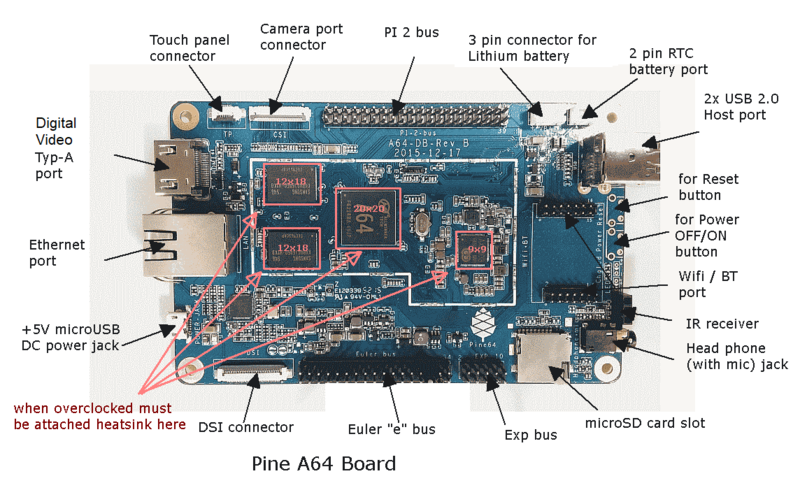 The complete description of the board is available as a picture here. I offer one card to the maintainer of deb-multimedia, Christian Marillat, in order to help him in building Debian packages of multimedia application like vlc, mythtv, kodi, mplayer, ffmpeg… for the debian arm64 port. First compilation tests show stability problems due to hoverheating of the processor . Monitoring the frequency of the proc with its temperature during a ffmpeg compilation showed that the temperature was as high as 80°C (176.0 °F) whereas the frequency did not exceed 750 MHz (the max is 1,2 GHz). Here is the diagram of the temperature and frequency over time during a ffmpeg compilation. The governor used is conservative. Those heatsinks are shipped with a thermal pad which allows an easier attachment to the IC. The board doesn't hang anymore and the temperature is lowered of 10°C (50°F) . As the processor is less hot, the frequency can be higher and stay more stable to around 820 MHz. .